Looking for new alphabet games for preschoolers? 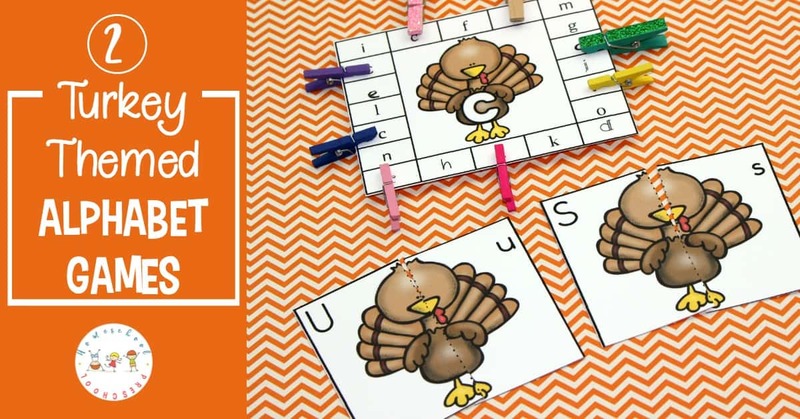 Don’t miss these turkey-themed alphabet games that are perfect for your lessons this Thanksgiving! 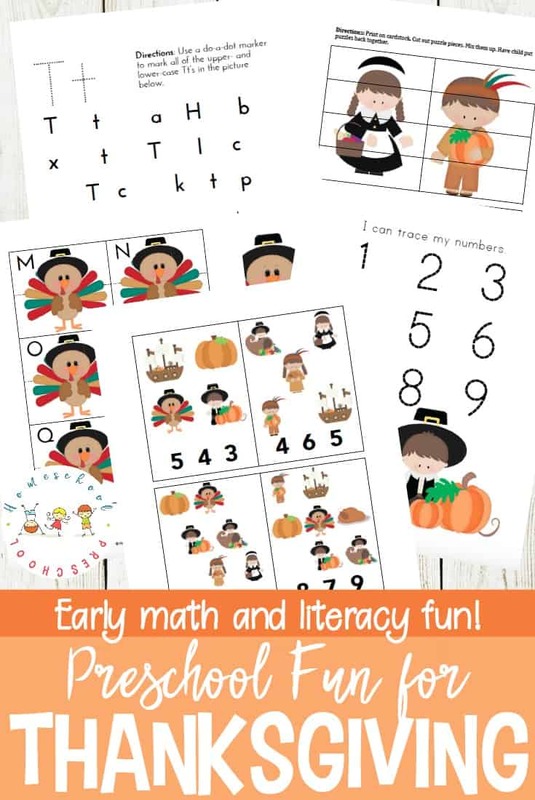 This collection includes two alphabet games that are perfect for your homeschool preschool lessons this holiday season. One game focuses on letter identification. The other focuses on matching uppercase and lowercase letters. 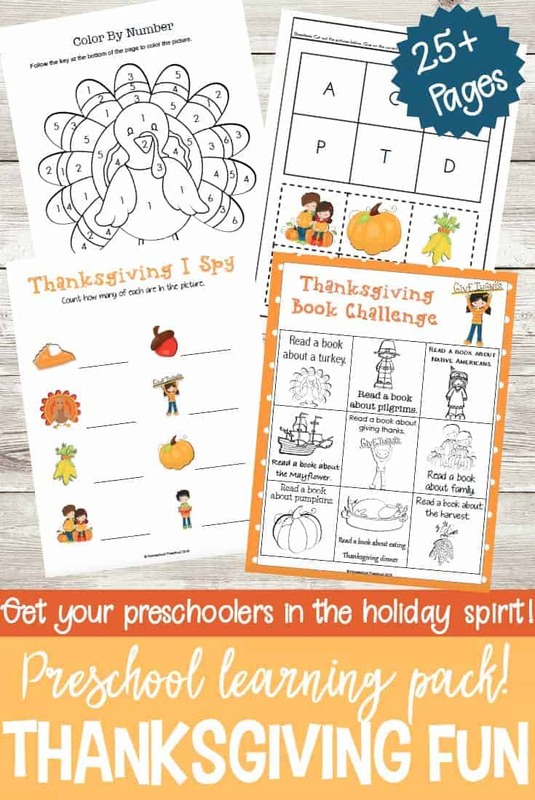 Both alphabet games are designed to inspire and engage your preschoolers as you practice the alphabet throughout the season. This set of printable alphabet games is designed with both black/white and color graphics. 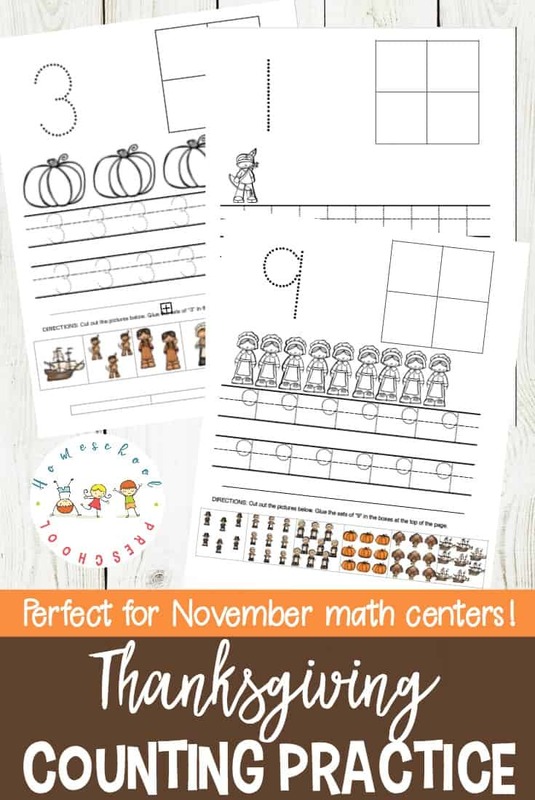 This allows you to choose which set to print for your preschoolers. The games with the black and white graphics can be printed on colored cardstock to brighten up the games without using an excessive amount of printer ink. No matter which sets you print (color or b/w), I suggest printing the pages on cardstock and laminating them all for durability. 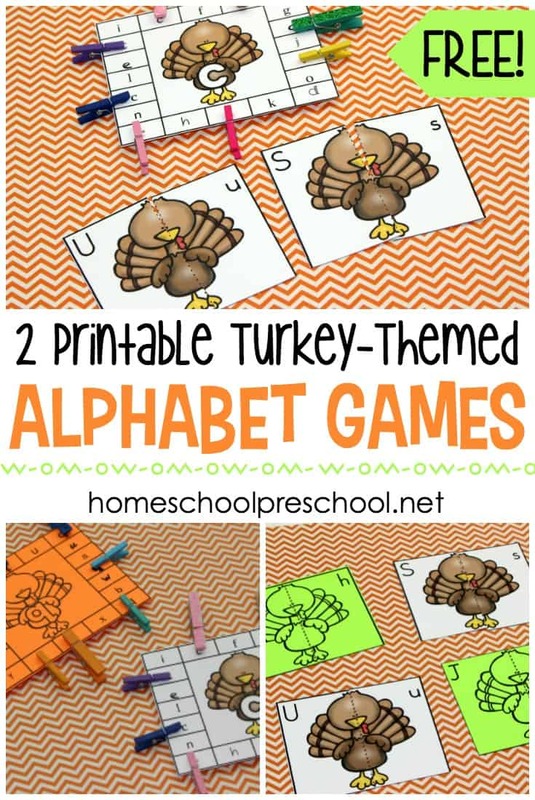 This will help your alphabet games for preschoolers stand up to many hours of play. 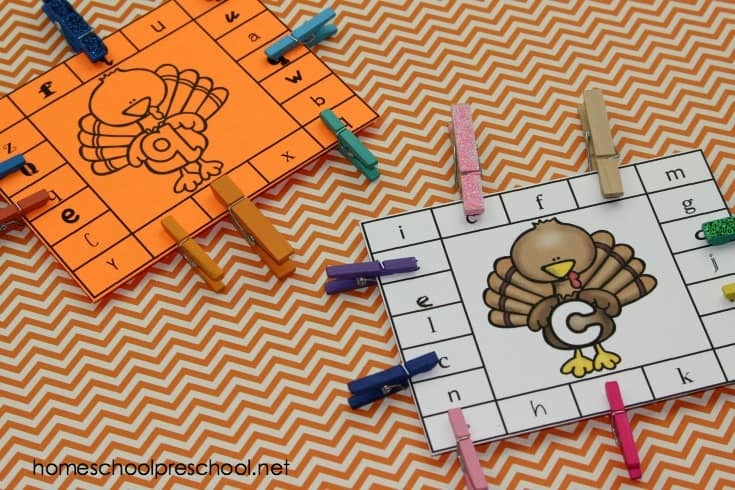 These game boards are perfect for kids who are working on letter recognition. Each clip board features a letter of the alphabet in the center of the game board. Around the edge of the board, there are various letters of the alphabet in various fonts. Your child’s job is to identify all of the featured letters (each board has 8) around the edge of the board. They can clip these letters with mini clothespins or with paper clips. Doing so, will also help your preschoolers build the fine motor muscles in their hands. You can make this a self-checking game by placing a small dot or sticker behind each correct letter before you laminate the clip boards. 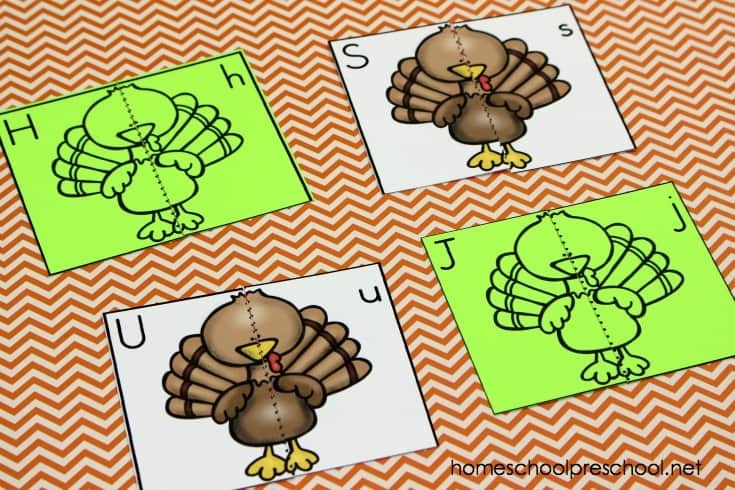 The alphabet matching game focuses on matching uppercase and lowercase letters. Print the cards on cardstock and laminate for durability. Cut the cards apart so that you have 26 sets of alphabet cards. Mix them up, and have your preschooler match the uppercase and lowercase letters. Younger preschoolers may only be able to work with a few cards at a time. Older preschoolers can search through the entire set for matches. As with the clip boards, you can make this a self-checking activity by placing matching stickers or dots on the back of each set. Fill your book basket with a great collection of Thanksgiving alphabet books. Most of these books can be found at your local library or used bookstore. If you have a hard time finding them, you can order them on Amazon by clicking the images below. This set of alphabet games is only available to my readers. Click the button below, enter your information, and you’ll be taken directly to the download file.